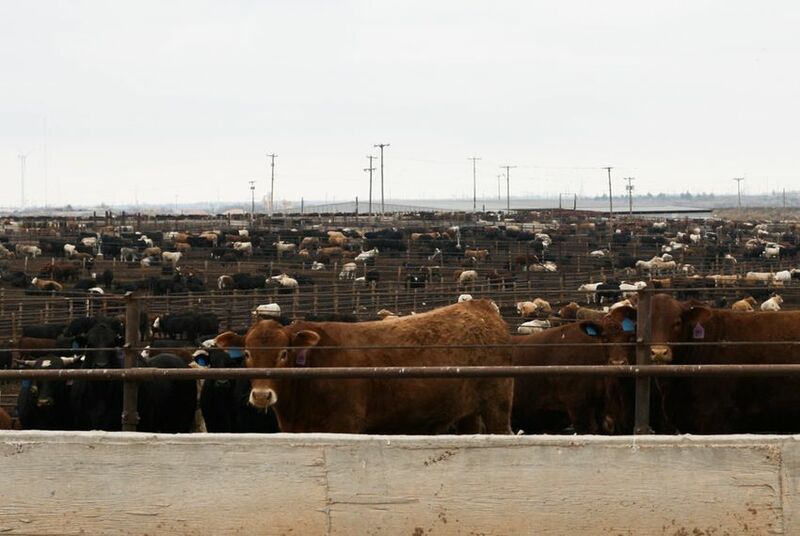 In a study slated for publication next month, two Texas Tech University scientists may have made their biggest discovery yet: DNA from antibiotic-resistant bacteria in cattle feedlots is airborne. COTTON CENTER – After years spent studying the dust that blows across the southern Great Plains, Phil Smith no longer looks at the dark haboobs that routinely rise over Lubbock without a healthy dose of apprehension. In a study slated for publication next month, he and Texas Tech University colleague Greg Mayer may have made their biggest discovery yet: DNA from antibiotic-resistant bacteria in cattle feedlots is airborne. For years, scientists have known that humans can contract antibiotic-resistant bacteria by consuming contaminated meat or water. The findings by Smith and Mayer indicate that humans could also be exposed to so-called "super bugs" or "super bacteria" traveling through the air. "This is the first test to open our eyes to the fact that we could be breathing these things," said Smith, an environmental toxicologist at Texas Tech. Antibiotics are commonly used on cows in industrial feedlots to treat disease and, more controversially, as a growth promoter added to cattle feed. It is estimated that up to 80 percent of antibiotics sold in the United States are used on livestock. The study may help explain how bacteria that no longer respond to antibiotics could be spreading and causing hard-to-treat infections in humans. Two million Americans are infected by antibiotic-resistant bacteria each year, while 23,000 die as a direct result of these infections, according to the Centers for Disease Control and Prevention. The cattle industry is pushing back, saying the report misrepresents the risk of super bacteria to human health. Dr. Sam Ives, a veterinarian working with the Texas Cattle Feeders Association, said antibiotic use in the industry is "judicious." "If I truly thought that the usage of these products was putting anyone at danger, I wouldn't be using them," Ives said. The study focused on feedlots in Texas' Panhandle and South Plains, each holding tens of thousands of cattle, where animals spend the last few months of their lives gaining weight before slaughter. Feedlots were an ideal place to study antibiotic resistance because bacteria there are exposed to high levels of antibiotics. Last year, Mayer and Smith collected dust samples upwind and downwind from 10 commercial cattle feed yards over six months. They set up high-tech vacuums on the nearest county road, collected particulate matter onto mesh screens, and took the samples to a lab where sophisticated machinery helped them identify the gene sequences, which Mayer calls the "fingerprints" of antibiotic-resistant bacteria. "The 'aha' moment came when we saw how much more prevalent resistant sequences were downwind than upwind," said Mayer, a molecular biologist at Texas Tech. "It was not just higher in some of them – it was 4,000 percent more. It made me not want to breathe." “What we have demonstrated is that this mechanism of transport is completely viable," Smith said of air travel by bacteria. “We believe that this bacteria could remain active for a long period of time and, given the wind that we have around Lubbock, it could be traveling for long distances." But he and Mayer are the first to admit that their findings raise a number of questions. Among them: What happens when the DNA of antibiotic-resistant bacteria, traveling on the wind, reaches its destination? "The judicious use of antibiotics as we are using them today has very little risk to human health,” Ives said. "My children work with me in the feedlot; my wife works with me. Am I concerned for their safety? No, I'm not." In 2013, the Food and Drug Administration issued guidelines for reducing antibiotic use for growth promotion in livestock, and earlier this year, the Obama administration announced that it would double funding aimed to fighting antibiotic resistance in its proposed 2016 budget. In the community of Cotton Center, about 40 miles north of Lubbock, Rocky Stone expressed mixed feelings about the study by Mayer and Smith. "The cattle industry employs a lot of people in this area," said Stone, superintendent of the Cotton Center school district. "Until someone shows me proof that there is a problem, I'm not going to worry about it."